Tummy troubles can cause more than a little upset. If you suffer from symptoms including bloating, sickness, discomfort, excess gas or cramps it can impact your life so much you’re often prevented from going about your daily business. Not only can you feel lethargic and uncomfortable, but it can be somewhat embarrassing; I know first hand of the issues surrounding IBS related symptoms, as someone that rarely goes a week without having some kind of flare up that leaves me in pain and my top button undone. IBS symptoms can impact as many as one in five people, with women being twice as likely to suffer than men, and are often triggered by sugar, alcohol and highly processed foods. However, it’s not just what you put in your body that can have an impact on your physical wellbeing – it’s also what goes on it your mind. muscles are also reduced, which in turn decreases the secretions needed for effective digestion. Stress can be detrimental to our mental and physical wellbeing, but for many IBS sufferers it can be a key trigger of their symptoms. So how do we manage these inconvenient and uncomfortable manifestations? The easiest way to keep your stress under control is via frequent light exercise; you don’t have to pump it hard in the gym for hours on end, but a light jog or a quick swim (or my personal preference, a touch of yoga) can help to clear the mind and put everything into perspective. Since I’ve been going to the gym a few times a week my stress levels have definitely decreased (it’s amazing how much impact ten minutes on the cross-trainer can make) and in turn there’s been a positive impact on my tummy too. Make a commitment to regularly get your bloody pumping, especially when stress levels are higher than normal. routines; it can help to re-balance the digestive system as well as clearing our minds. Mindfulness may seem slightly hocus pocus, but it really can make a positive difference and help us to let go of the stresses and worries that are bogging us down. Clearing our minds, focusing on our breathing and remembering to appreciate the little things is such a great way to start the day; committing to only ten minutes every morning can make such a difference overall. 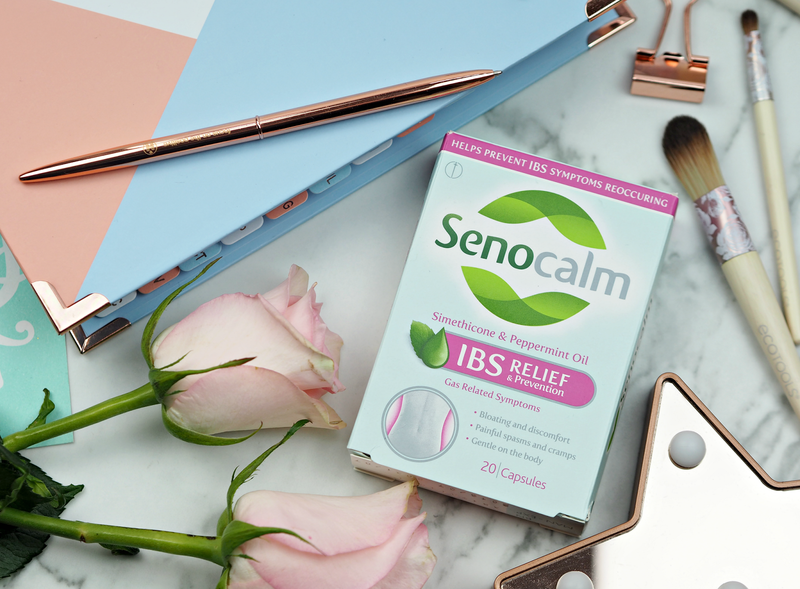 Senocalm is a new product that’s been developed for the relief from IBS gas-related symptoms (including bloating, painful spasms and cramps,) and offers peace of mind to help us busy women carry on with our lives – because nobody wants IBS stopping them in their tracks. It’s gentle on the body and contains soothing simethicone (an anti-foaming agent that causes gas bubbles to collapse and collect together, forming larger gas bubbles that can pass more easily out of the intestines,) to allow the body to process gas in a natural way. I’ve been using this during a really stressful couple of weeks and it’s made such a difference; within thirty minutes I feel my symptoms easing and able to carry on with my day. 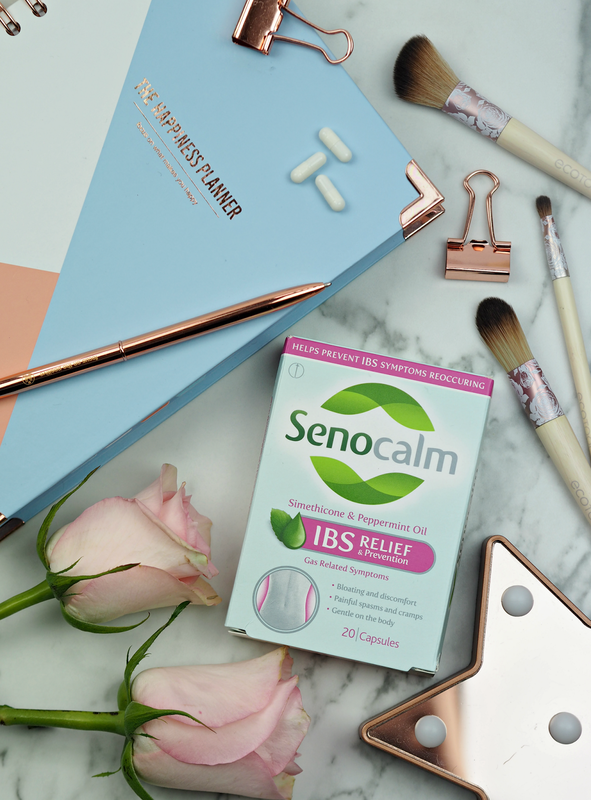 The capsules tablets are also handbag friendly and , incredibly discrete so great for when you’re on-the-go.and work quickly so you don’t have to stop; whether you take them as a preventative measure or use them to ease your existing discomfort, Senocalm really does work a treat. Senocalm is available to purchase from Boots, Tesco, Asda, Morrisons, Sainsbury and independent pharmacies, priced £5.99 for 20 capsules. 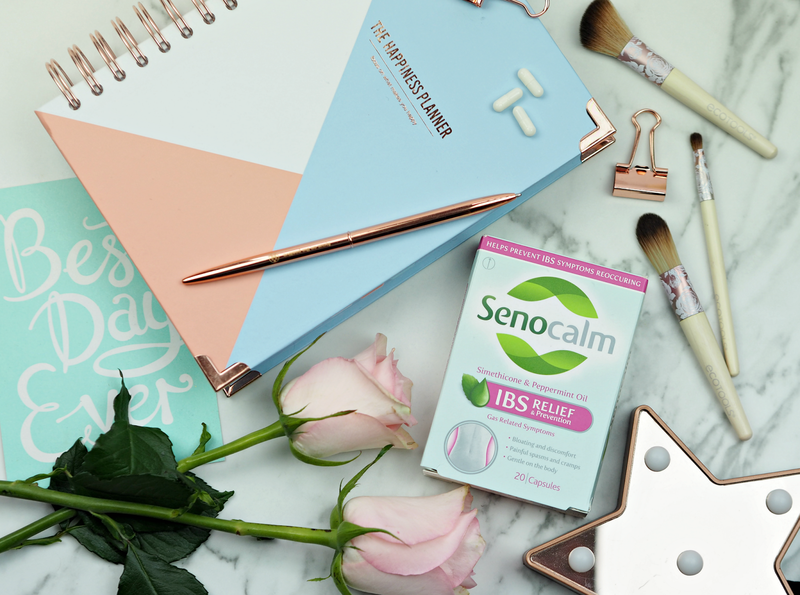 Senocalm is a medical device; always read the instructions; this information is not meant to diagnose or prescribe; this product is not intended to relieve constipation or diarrhoea. This blog post is intended for audiences in the UK only. Wow! I wish mine had! But I believe you can grow in and out of things. They've really been helping me – they're pretty quick at nipping it in the bud too, when you feel like you're about to have a flare up. Stress is the worst for me – we hold all our tension in our gut, so it's no surprise it can cause problems! Thanks for talking about this! So many of us suffer in silence because it's just plain embarrassing to admit, which probably just makes it worse as we're then stressed about it! This post is no longer being monitored by Senocalm. If you have any questions, please speak to your GP or Pharmacist.